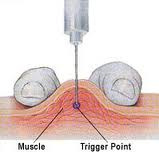 Trigger point injection therapy is a procedure used to treat painful areas of muscle that contain trigger points, or knots of muscle that form when muscles do not relax. Many times, such knots can be felt under the skin. Trigger points may irritate the nerves around them and cause referred pain, or pain that is felt in another part of the body. In the TPI procedure, a health care professional inserts a small needle into the patient's trigger point. The injection contains homeopathics, vitamin B12 and a local anesthetic. With the injection, the trigger point is made inactive and the pain is alleviated. Usually, a brief course of treatment will result in sustained relief. Injections are done in the naturopathic doctors office. Several sites may be injected in one visit. If you have an allergy to a certain drug, a dry-needle technique (involving no solution) or acupuncture needle can be used. TPI is used to treat many muscle groups, especially those in the arms, legs, lower back, and neck. In addition, TPI can be used to treat fibromyalgia and tension headaches. The technique is also used to alleviate myofascial pain syndrome (chronic pain involving tissue that surrounds muscle) that does not respond to other treatments. Fill out the contact form on the right if you think you might benefit from Trigger Point Injection Therapy and we will contact you promptly.